Soluble urokinase plasminogen activation receptor (suPAR) is an emerging new biomarker, which has been shown to not only correlate with traditional biomarkers but also outperform CRP at prognosticating CVD. More clinical trials on suPAR is in the future research agenda. Background: The identification of biomarkers for predicting morbidity and mortality, particularly in pediatric population undergoing cardiac surgery will contribute toward improving the patient outcome. There is an increasing body of literature establishing the clinical utility of hyperlactatemia and lactate clearance as prognostic indicator in adult cardiac surgical patients. However, the relationship between lactate clearance and mortality risk in the pediatric population remains to be established. Objective: To assess the role of lactate clearance in determining the outcome in children undergoing corrective surgery for tetralogy of Fallot (TOF). Methods and Study Design: A prospective, observational study. Setting: A tertiary care center. Study Population: Two hundred children undergoing elective surgery for TOF. Study Method: Blood lactate levels were obtained as baseline before operation (T0), postoperatively at admission to the cardiac intensive care unit after surgery (T1), and then at every 6 h for the first 24 h of Intensive Care Unit (ICU) stay (T6, T12, T18, and T24, respectively). The lactate clearance in the study is defined by the equation ([lactate initial - lactate delayed]/lactate initial) ×100%. Lactate clearance was determined at T1-T6, T1-T12, T1-T18, and T1-T24 time interval, respectively. The primary outcome measured was mortality. Secondary outcomes measured were the duration of mechanical ventilation, duration of inotropic requirement, and duration of ICU stay. Results: Eleven out of the two hundred patients enrolled in the study died. Nonsurvivors had higher postoperative lactate concentration (P < 0.05) and low-blood lactate clearance rate during 24 h (P < 0.05) in comparison to the survivors. Lactate clearance was significantly higher in survivors than in nonsurvivors for the T1-T6 period (19.55 ± 14.28 vs. 5.24 ± 27.79%, P = 0.009) and remained significantly higher for each studied interval in first 24 h. Multivariate logistic regression analysis of statistically significant univariate variables showed early lactate clearance to have a significant relationship with mortality. Patients with a lactate clearance >10%, relative to patients with a lactate clearance <10%, in the early postoperative period, had improved outcome and lower mortality. Conclusion: Lactate clearance in the early postoperative period (6 h) is associated with decreased mortality rate. Patients with higher lactate clearance (>10%) after 6 h have improved outcome compared with those with lower lactate clearance. Objective: Acute kidney injury (AKI) is a commonly encountered postoperative complication after cardiac surgery especially in high risk patients. AKI though seen more commonly after conventional on pump coronary artery bypass surgery (CCABG), is not uncommon after off pump coronary bypass surgery (OPCAB). Various biomarkers have shown promise over last one decade as an early marker for predicting AKI postoperatively. NGAL is one such biomarker whose concentration is increased in urine after any nephrotoxic and ischemic insult. The objective of this study was to assess the role of urine NGAL in predicting AKI after OPCAB in patients with increased risk of developing AKI. Design: A prospective cohort study. Setting: A clinical study in a multi specialty hospital. Participants: Eighty patients. Materials and Methods: study was approved by the hospital research ethics committee. 80 patients posted for OPCAB with an increased risk of developing AKI defined as having a Cleveland Clinic Foundation Acute renal failure scoring System score of ≥6 were included in the study. Patients with coronary angiography (CAG) within 48 hrs prior to surgery, pre-existing AKI, preoperative renal replacement therapy (RRT) and CKD stage 5 were excluded. Urine NGAL level before the start of surgery baseline and at 4 hrs post surgery were done. Renal function tests were assessed on the day of surgery (4 hrs post surgery) and on the next three days. Result: Seven patients developed AKI as defined by acute kidney infection network (AKIN) and risk injury failure loss end stage (RIFLE) criteria for AKI. 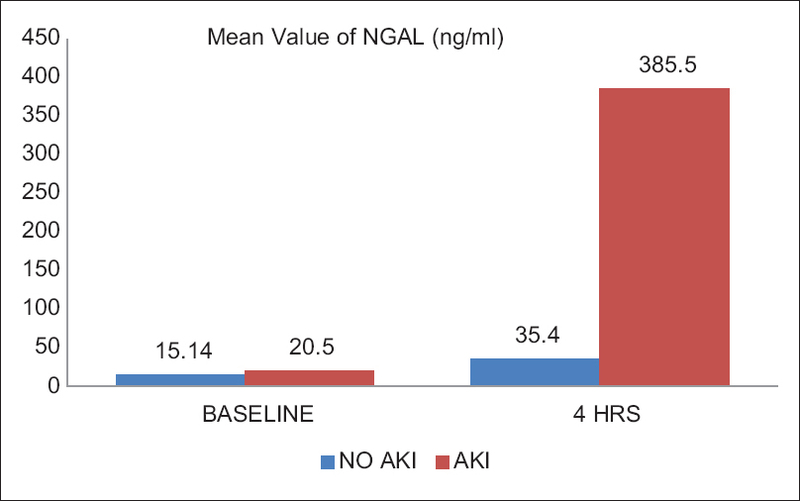 NGAL value at 4 hrs in patients who developed AKI was significantly higher than in those patients who did not develop AKI (P < 0.05). Conclusion: urine NGAL is an early biomarker of acute kidney injury in patients undergoing OPCAB surgeries. However, large multicentre studies may be needed to confirm it. Context: Left ventricle diastolic dysfunction (LVDD) is gaining importance as useful marker of mortality and morbidity in cardiac surgical patients. 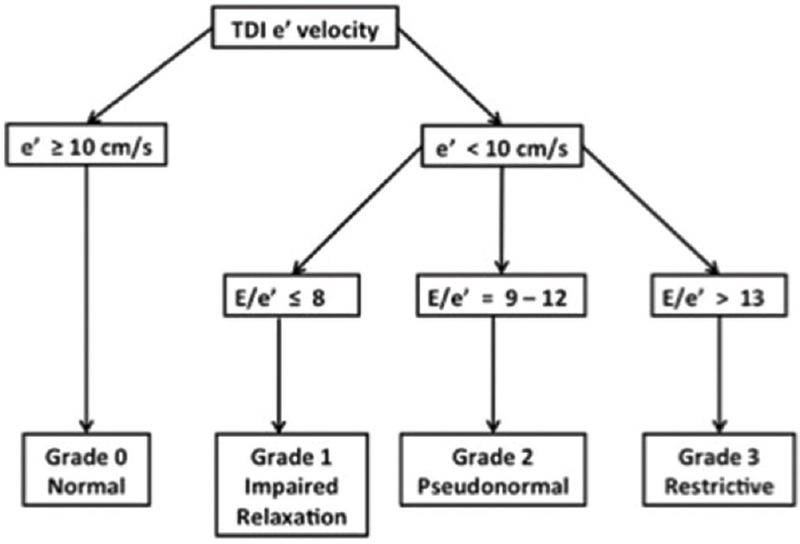 Different algorithms have been proposed for the intraoperative grading of DD. Knowledge of the particular grade of DD has clinical implications with the potential to modify therapy, but there is a paucity of literature on the role of diastolic function evaluation during off-pump coronary artery bypass grafting (OPCABG) surgery. Aims: The aim of this study was to monitor changes in LVDD using simplified algorithm proposed by Swaminathan et al. in patients undergoing OPCABG. Settings and Design: The study was conducted in a tertiary care level hospital; this was a prospective, observational study. Subjects and Methods: Fifty consecutive patients undergoing OPCABG were enrolled. 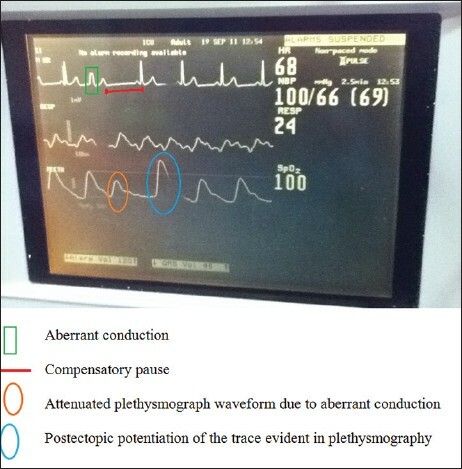 Hemodynamic and echocardiographic parameters were measured at 6 stages in every patient namely after anesthetic induction (baseline), during left internal mammary artery (LIMA) to left anterior descending (LAD) grafting (LIMA → LAD), saphenous vein graft (SVG) to obtuse marginal (OM) grafting (SVG → OM), SVG to posterior descending artery (PDA) grafting (SVG → PDA), during proximal anastomosis of SVG to aorta, and postprotamine. The patients were classified in grades of LVDD as per simplified algorithm proposed by Swaminathan et al. using only intraoperatively measured E and E'. Results: The success rate of measurement and classification of LVDD was 98.92% (277 out of 280 measurements). The grades of LVDD varied significantly as per surgical steps with maximum downgrading occurring during OM and LAD grafting. During OM grafting, none of the patients had normal diastolic function while 29% of patients exhibited restrictive pattern (Grade 3 LVDD). Patients with normal baseline LV diastolic function also exhibited downgrading during OM and LAD grafting. Postprotamine, 37% of patients with normal baseline diastolic function continued to exhibit some degree of DD. Conclusions: The LVDD changes dynamically during various stages of OPCABG, which can be successfully monitored with simplified algorithm. Background: Recently, evidence of cardio-protection and reduction in mortality due to the use of volatile agents during cardiac surgery led to an increase in their use during cardiopulmonary bypass (CPB). These findings seem to be enhanced when the volatile agents are used during all the surgical procedure, including the CPB period. 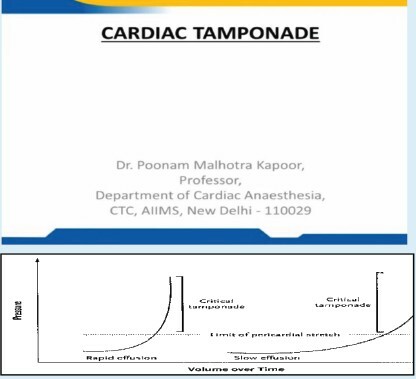 Aims: Since the administration of volatile agents through CPB can be beneficial to the patients, we decided to review the use of volatile agents vaporized in the CPB circuit and to summarize some tricks and tips of this technique using our 10-year experience of Brazilian and Italian centers with a large volume of cardiac surgeries. Study Setting: Hospital. Methods: A literature review. Results: During the use of the volatile agents in CPB, it is very important to analyze all gases that come in and go out of the membrane oxygenators. The proper monitoring of inhaled and exhaled fraction of the gas allows not only monitoring of anesthesia level, but also the detection of possible leakage in the circuit. Any volatile agent in the membrane oxygenator is supposed to pollute the operating theater. This is the major reason why proper scavenging systems are always necessary when this technique is used. Conclusion: While waiting for industry upgrades, we recommend that volatile agents should be used during CPB only by skilled perfusionists and physicians with the aim to reduce postoperative morbidity and mortality. Background: Proficiency in transthoracic echocardiography (TTE) requires an integration of cognitive knowledge and psychomotor skills. Whereas cognitive knowledge can be quantified, psychomotor skills are implied after repetitive task performance. We applied motion analyses to evaluate psychomotor skill acquisition during simulator-based TTE training. Methods and Results: During the first month of their fellowship training, 16 cardiology fellows underwent a multimodal TTE training program for 4 weeks (8 sessions). The program consisted of online and live didactics as well as simulator training. Kinematic metrics (path length, time, probe accelerations) were obtained at the start and end of the course for 8 standard TTE views using a simulator. At the end of the course TTE image acquisition skills were tested on human models. 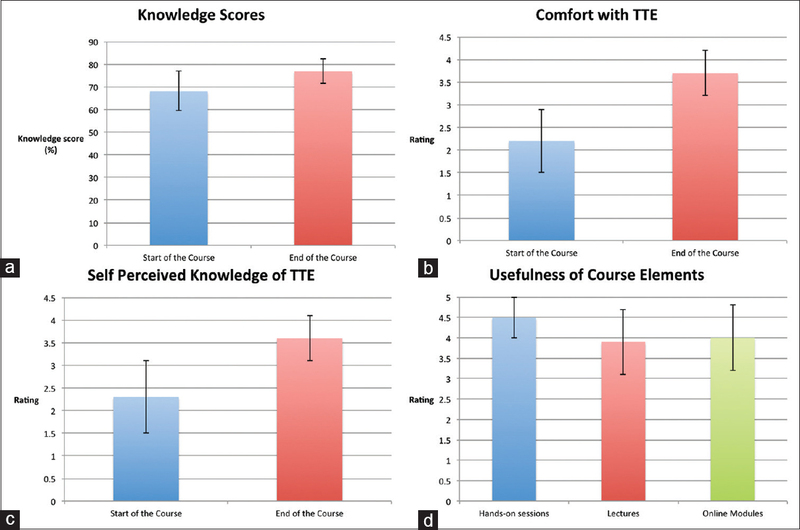 After completion of the training program the trainees reported improved self-perceived comfort with TTE imaging. There was also an increase of 8.7% in post-test knowledge scores. There was a reduction in the number of probe accelerations [median decrease 49.5, 95% CI = 29-73, adjusted P < 0.01], total time [median decrease 10.6 s, 95% CI = 6.6-15.5, adjusted P < 0.01] and path length [median decrease 8.8 cm, 95% CI = 2.2-17.7, adjusted P < 0.01] from the start to the end of the course. During evaluation on human models, the trainees were able to obtain all the required TTE views without instructor assistance. Conclusion: Simulator-derived motion analyses can be used to objectively quantify acquisition of psychomotor skills during TTE training. Such an approach could be used to assess readiness for clinical practice of TTE. Background: Confirmation of placement of Double lumen endobronchial tubes (DLETT) and bronchial blockers (BBs) with the pediatric fiberoptic bronchoscope (FOB) is the most preferred practice worldwide. Most centers possess standard adult FOBs, some, particularly in developing countries might not have access to the pediatric-sized devices. We have evaluated the role of preintubation airway assessment using the former, measuring the distance from the incisors to the carina and from carina to the left and right upper lobe bronchus in deciding the depth of insertion of the lung isolation device. Methods: The study was a randomized, controlled, double-blind trial consisting of 84 patients (all >18 years) undergoing thoracic surgery over a 12-month period. 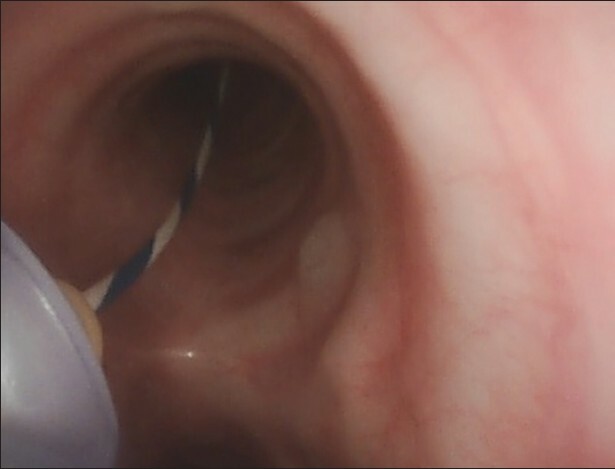 In the study group (n = 38), measurements obtained during FOB with the adult bronchoscope decided the depth of insertion of the lung isolation device. In the control group (n = 46), DLETTs and BBs were placed blindly followed by clinical confirmation by auscultation. Selection of the type and size of the lung isolation device was at the discretion of the anesthesiologist conducting the case. In all cases, pediatric FOB was used to confirm accurate placement of devices. Results: Of 84 patients (DLETT used in 76 patients; BB used in 8 patients), preintubation airway measurements significantly improved the success rate of optimal placement of lung isolation device from 25% (11/44) to 50% (18/36) (P = 0.04). Our incidence of failed device placement at initial insertion was 4.7% (4/84). Incidence of malposition was 10% (8/80) with 4 cases in each group. The incidence of suboptimal placement was lower in the study group at 38.9% (14/36) versus 65.9% (29/44). Conclusions: Preintubation airway measurements with the adult FOB reduces airway manipulations and improves the success rate of optimal placement of DLETT and BB. Background: Timely decision making in Intensive Care Unit (ICU) is very essential to improve the outcome of critically sick patients. Conventional scores like Acute Physiology and Chronic Health Evaluation (APACHE IV) are quite cumbersome with calculations and take minimum 24 hours. Procalcitonin has shown to have prognostic value in ICU/Emergency department (ED) in disease states like pneumonia, sepsis etc. NTproBNP has demonstrated excellent diagnostic and prognostic importance in cardiac diseases. It has also been found elevated in non-cardiac diseases. We chose to study the prognostic utility of these markers on ICU admission. Settings and Design: Retrospective observational study. Materials and Methods: A Retrospective analysis of 100 eligible patients was done who had undergone PCT and NTproBNP measurements on ICU admission. Their correlations with all cause mortality, length of hospital stay, need for ventilator support, need for vasopressors were performed. Results: Among 100 randomly selected ICU patients, 28 were non-survivors. NTproBNP values on admission significantly correlated with all cause mortality (P = 0.036, AUC = 0.643) and morbidity (P = 0.000, AUC = 0.763), comparable to that of APACHE-IV score. PCT values on admission did not show significant association with mortality, but correlated well with morbidity and prolonged hospital length of stay (AUC = 0.616, P = 0.045). 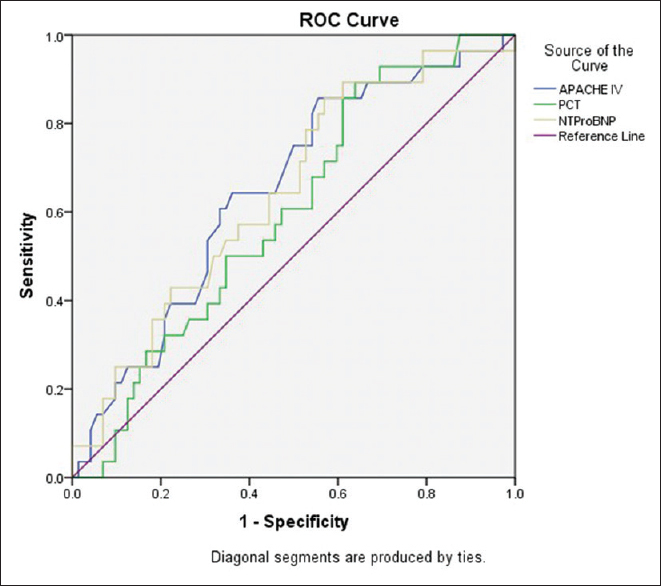 Conclusion: The current study demonstrated a good predictive value of NTproBNP, in terms of mortality and morbidity comparable to that of APACHE-IV score. Procalcitonin, however, was found to have doubtful prognostic importance. These findings need to be confirmed in a prospective larger study. Introduction: Electroconvulsive therapy (ECT) is an effective treatment for many mental disorders, especially severe and persistent depression, bipolar disorder, and schizophrenia. The aim of this study is to compare the effect of dexmedetomidine and alfentanil on agitation, satisfaction, seizure duration, and patients hemodynamic after ECT. Materials and Methods: In a three phase crossover randomized clinical trial, 75 patients aged between 18 and 50 years and candidate for ECT were enrolled and assigned into three groups (25 patients in each group). All patients, respectively, took premedication of dexmedetomidine, alfentanil, or saline in three consecutive phases. Patients received 0.5 μg/kg dexmedetomidine, 10 μg/kg alfentanil or normal saline intravenously, 10 min before induction. Finally, seizure and recovery duration, satisfaction and agitation score, and hemodynamic parameters were evaluated. Results: There was no significant difference about seizure duration, agitation score, and hemodynamic parameters between groups but recovery duration was significantly lower in the control group than dexmedetomidine (P = 0.016) and alfentanil group (P = 0.0001). Patients' satisfaction was significantly higher in intervention groups (alfentanil and dexmedetomidine groups) (P = 0.0001). Conclusion: Given the equal effects of alfentanil and dexmedetomidine, it seems that choosing one of these two drugs for premedication of patients undergoing ECT is appropriate. Drug choice is influenced by numerous factors such as accessibility of each drug and the dominance of anesthesiologist and psychiatrist. Background: Lactate and central venous oxygen saturation (ScVO2) are well known biomarkers for adequacy of tissue oxygenation. Endothelin, an inflammatory marker has been associated with patient's nutritional status and degree of cyanosis. The aim of this study was to explore the hypothesis that lactate, ScVO2 and endothelin before induction may be predictive of mortality in pediatric cardiac surgery. Methods: We conducted a prospective observational study of 150 pediatric (6 months to 12 years) patients who were posted for intracardiac repair for tetralogy of fallot and measured lactate, ScVO2 and endothelin before induction (T1), 20 minutes after protamine administration (T2) and 24 hours after admission to ICU (T3). Results: Preinduction lactate and endothelin levels were found to predict mortality in patients of tetralogy of fallot with an odds ratio of 6.020 (95% CI 2.111-17.168) and 1.292(95% CI 1.091-1.531) respectively. In the ROC curve analysis for lactate at T1, the AUC was 0.713 (95% CI 0.526-0.899 P = 0.019). At the cutoff value of 1.750mmol/lt, the sensitivity and specificity for the prediction of mortality was 63.6% and 65.5%, respectively. For endothelin at T1, the AUC was 0.699 (95% CI 0.516-0.883, P = 0.028) and the cutoff value was ≤2.50 (sensitivity, 63.6%; specificity, 58.3 %). 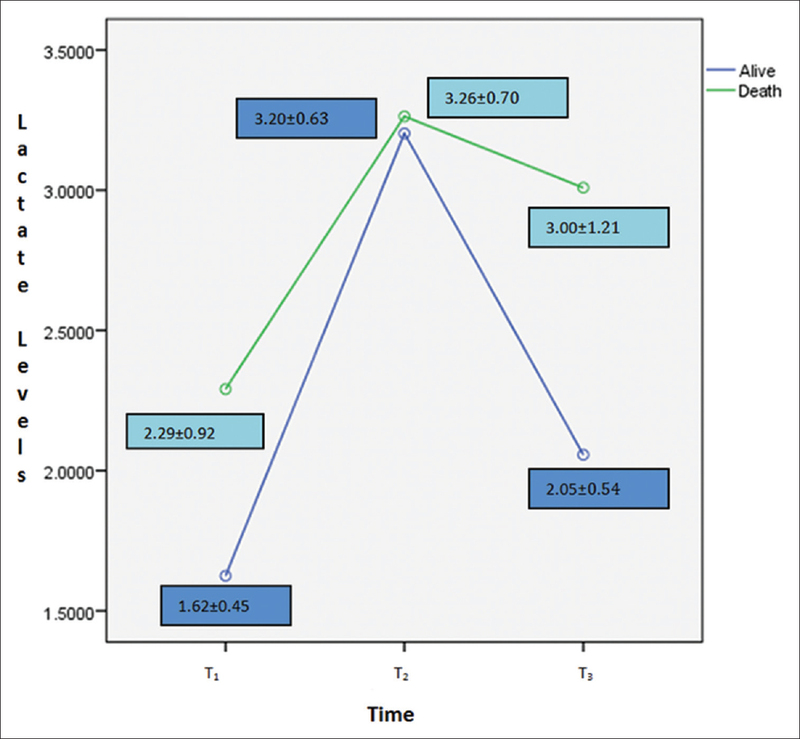 ScVO2 (odds ratio 0.85) at all three time intervals, suggested that improving ScVO2 can lead to 15% reduction in mortality. Conclusions: Lactate, ScVO2 and endothelin all showed association with mortality with lactate having the maximum prediction. Lactate was found to be an independent, reliable and cost-effective measure of prediction of mortality in patients with tetralogy of fallot. Background: The modification in technique is useful for successful right-sided internal jugular vein (IJV) cannulation on the same side even after intra-arterial puncture without using ultrasound guidance in adult patients. 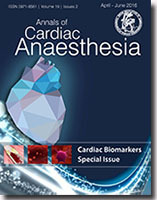 Materials and Methods: This study was carried out in total 160 adult patient from American Society of Anesthesiologists Grade II to III patients male (n = 95) and female (n = 65) who underwent cardiac surgery where cannulation was done on right sided by triple lumen catheter (7 French) using Seldinger technique. Results: Majority of patients were cannulated successfully by Seldinger technique with single or double attempt except for five patients in which arterial puncture occurred. All five patients were cannulated successfully on the same side with this modified technique without any significant major complications. They were managed by application of blocker at the end of arterial needle puncture without removing it. In our routine practice, we were used to removing this needle and applying compression for few minutes to prevent hematoma formation after an arterial puncture. In this study, cannula was used as a marker or guideline for the relocation of IJV on the same side and recannulation was performed by changing the direction of needle on same side lateral to the previous one and without going towards the same direction to prevent the arterial puncture again. Conclusion: Most simple and useful modified technique for institutes where the complications are most common with trainee doctors and in hospitals where there is no advanced facility like ultrasound-guided cannulation available. By this modification, it will be time saving, very comfortable, and user-friendly technique with high success rate. Background: Nosocomial infections (NIs) in the postoperative period not only increase morbidity and mortality, but also impose a significant economic burden on the health care infrastructure. This retrospective study was undertaken to (a) evaluate the incidence, characteristics, risk factors and outcomes of NIs and (b) identify common microorganisms responsible for infection and their antibiotic resistance profile in our Cardiac Surgical Intensive Care Unit (CSICU). Patients and Methods: After ethics committee approval, the CSICU records of all patients who underwent cardiovascular surgery between January 2013 and December 2014 were reviewed retrospectively. The incidence of NI, distribution of NI sites, types of microorganisms and their antibiotic resistance, length of CSICU stay, and patient-outcome were determined. Results: Three hundred and nineteen of 6864 patients (4.6%) developed NI after cardiac surgery. 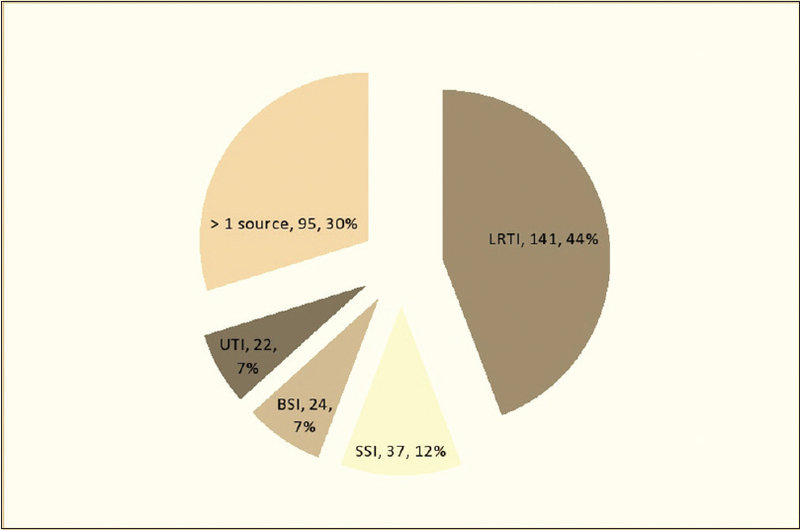 Lower respiratory tract infections (LRTIs) accounted for most of the infections (44.2%) followed by surgical-site infection (SSI, 11.6%), bloodstream infection (BSI, 7.5%), urinary tract infection (UTI, 6.9%) and infections from combined sources (29.8%). Acinetobacter, Klebsiella, Escherichia coli, and Staphylococcus were the most frequent pathogens isolated in patients with LRTI, BSI, UTI, and SSI, respectively. The Gram-negative bacteria isolated from different sources were found to be highly resistant to commonly used antibiotics. Conclusion: The incidence of NI and sepsis-related mortality, in our CSICU, was 4.6% and 1.9%, respectively. Lower respiratory tract was the most common site of infection and Gram-negative bacilli, the most common pathogens after cardiac surgery. Antibiotic resistance was maximum with Acinetobacter spp. 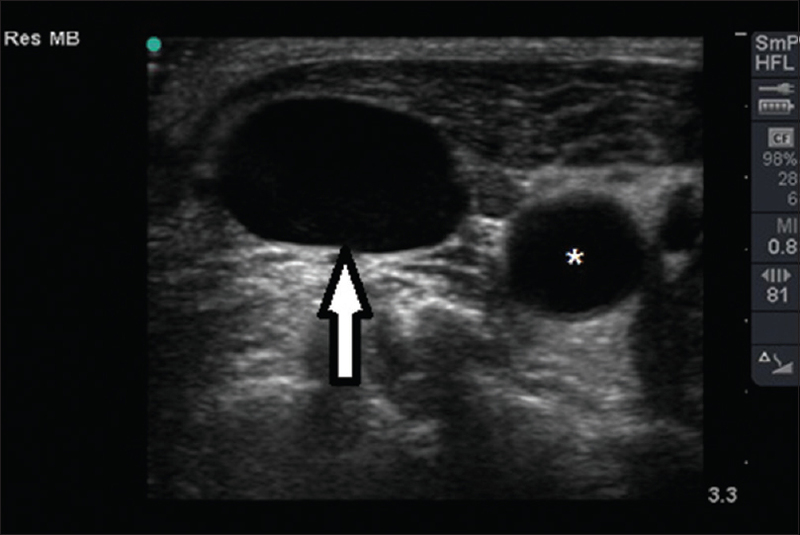 Context: Real-time ultrasound guidance for internal jugular (IJ) vein cannulation enhances safety and success. Aims: This study aims to compare the long- and short-axis (LA and SA) approaches for ultrasound-guided IJ vein cannulation. Subjects and Methods: Patients undergoing surgery and in intensive care unit requiring central venous cannulation were randomized to undergo either LA or SA ultrasound-guided cannulation of the IJ vein by a skilled anesthesiologist. First pass success, the number of needle passes, time required for insertion of guidewire, and complications were documented for each procedure. Results: The IJ vein was successfully cannulated in all patients. There are no significant differences between the two groups in terms of gender, diameter of IJ vein, margin of safety, and time required for insertion of guidewire. There was also no significant difference between the two groups in terms of side of IJ vein cannulated, patient on mechanical ventilation, number of skin puncture, number of needle redirections, first pass success, and carotid puncture. However, there is a significant relationship between the diameter of IJ vein with first pass (18.18 ± 4.72 vs. 15.21 ± 4.24; P < 0.004) and margin of safety with of incidence of carotid puncture (12.15 ± 4.03 vs. 6.59 ± 3.13; P < 0.016). Conclusions: Both techniques have similar outcomes when used for IJ vein cannulation. Objective: Review of intraoperative anesthetic challenges and the role of transesophageal echocardiography in children with sinus venosus atrial septal defect and partial anomalous pulmonary venous drainage undergoing Warden repair. Design: A retrospective observational case series. Methodolgy: Pediatric patients who underwent Warden repair between October 2011-September 2015 were recruited. Their preoperative clinical details, anesthetic techniques, intraoperative TEE findings and postoperative events were recorded from the medical records. The categorical variables and the continuous variables were expressed as number (percentages) and mean ΁ SD respectively. Results: A total of 35 patients were operated for Warden repair during the study period. Anesthesia was induced with the aim to prevent any fall in pulmonary vascular resistance. The right internal jugular vein was cannulated under ultrasound guidance using a short length cannula to monitor right superior vena cava pressure. Intraoperative TEE revealed the drainage of PAPVC high into RSVC in 22 patients. Persistent LSVC was found in 9 patients. After repair, TEE imaging detected a high gradient at Warden anastomotic site in 5 patients and 3 of them required revision of surgery. 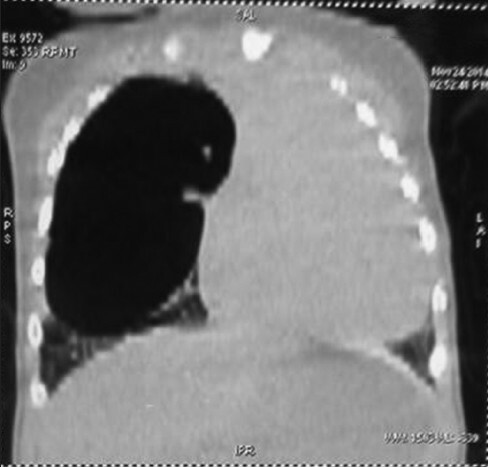 Rerouted pulmonary veins required surgical correction in 2 patients in view of obstruction. None of them had pulmonary venous and SVC obstruction in the postoperative period. Conclusion: The primary aim of anesthesia is to avoid any fall in PVR. Right IJV cannulation can be beneficial. The intraoperative TEE can help in delineating the anatomy of lesion and detecting anastomotic site obstruction. Introduction: Hypoalbuminemia is a well-recognized predictor of general surgical risk and frequently occurs in patients with cyanotic congenital heart disease (CCHD). Moreover, cardiopulmonary bypass (CPB)-induced an inflammatory response, and the overall surgical stress can effect albumin concentration greatly. The objective of his study was to track CPB-induced changes in albumin concentration in patients with CCHD and to determine the effect of hypoalbuminemia on postoperative outcomes. Materials and Methods: Prospective observational study conducted in 150 patients, Group 1 ≤18 years (n = 75) and Group 2 >18 years (n = 75) of age. Albumin levels were measured preoperatively (T1), after termination of CPB (T2) and 48 h post-CPB (T3). Primary parameters (mortality, duration of postoperative ventilation, duration of inotropes and duration of Intensive Care Unit [ICU] stay) and secondary parameters (urine output, oliguria, arrhythmias, and hemodynamic parameters) were recorded. 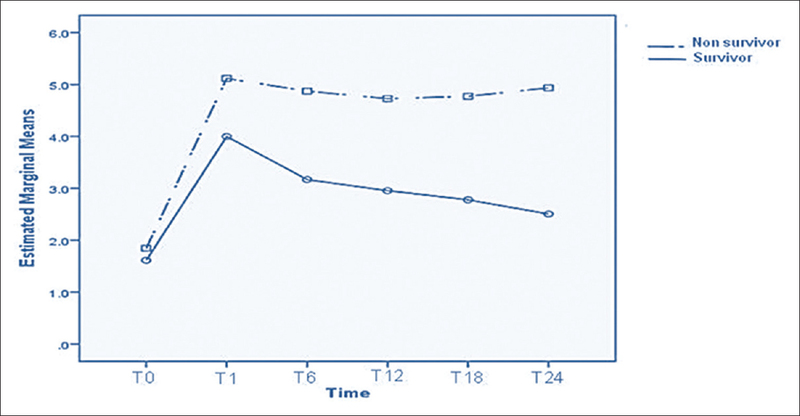 Results: The albumin levels in Group 1 at T1, T2, and T3 were 3.8 ± 0.48, 3.2 ± 0.45 and 2.6 ± 0.71 mg/dL; and in Group 2 were 3.7 ± 0.50, 3.2 ± 0.49 and 2.7 ± 0.62 mg/dL respectively. All patients showed a significant decrease in albumin concentration 48 h after surgery (P < 0.01). Analysis between the groups, however, showed no statistical difference. Eleven patients expired during the study period, and nonsurvivors showed significantly lower serum albumin concentration 48 h after surgery 2.3 ± 0.62 mg/dL versus 3.7 ± 0.56 mg/dL in the survivors (P < 0.05). 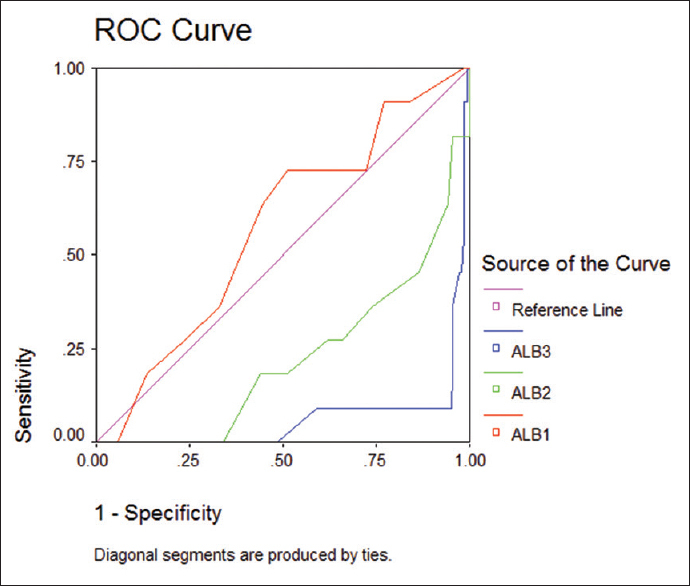 Receiver operating characteristic curve showed that a baseline albumin cut-off value of 3.3 g/dL predicts mortality with a positive predictive value 47.6% and a negative predictive value of 99.2% (P < 0.05). A strong correlation was seen between albumin levels at 48 h with duration of CPB ( r2 = 0.6321), ICU stay ( r2 = 0.7447) and incidence of oliguria ( r2 = 0.8803). Conclusions: The study demonstrated similar fall in albumin concentration in cyanotic patients (both adult and pediatric) in response to CPB. Low preoperative serum albumin concentrations (<3.3 g/dL) can be used to identify and prognosticate subset of cyanotics predisposed to additional surgical risk. Acute kidney injury is a common complication after pediatric cardiac surgery. 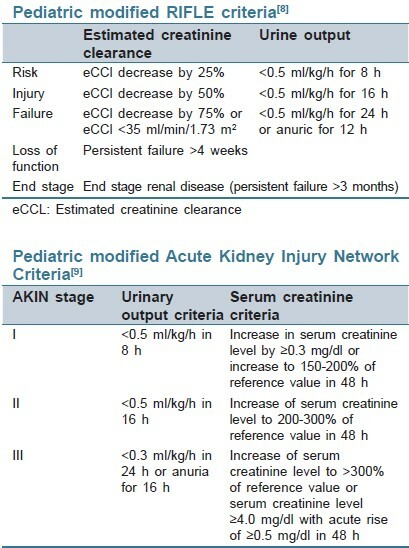 The definition, staging, risk factors, biomarkers and management of acute kidney injury in children is detailed in the following review article. As millions of surgical procedures are performed worldwide on an aging population with multiple comorbidities, accurate and simple perioperative risk stratification is critical. 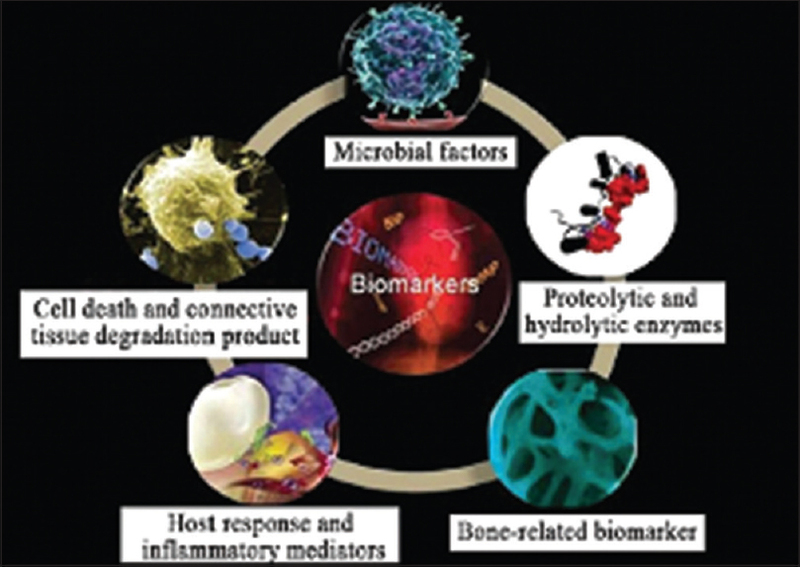 The cardiac biomarker, brain natriuretic peptide (BNP), has generated considerable interest as it is easy to obtain and appears to have powerful predictive and prognostic capabilities. BNP is currently being used to guide medical therapy for heart failure and has been added to several algorithms for perioperative risk stratification. This review examines the current evidence for the use of BNP in the perioperative period in patients who are at high-cardiovascular risk for noncardiac surgery. In addition, we examined the use of BNP in patients with pulmonary embolism and left ventricular assist devices. The available data strongly suggest that the addition of BNP to perioperative risk calculators is beneficial; however, whether this determination of risk will impact outcomes, remains to be seen. Serum troponin elevation above the 99th percentile of the upper reference limit in healthy subjects (<0.01 ng/ml measured using currently available high-sensitivity cardiac troponin laboratory assays) is required to establish the diagnosis the diagnosis of myocardial necrosis in acute cardiovascular syndromes, as well as guide prognosis and therapy. In the perioperative period, for patients with cardiac disease undergoing noncardiac surgery, it is a particularly critical biomarker universally used to assess the myocardial damage. The value of troponin testing and elevation (as well as its significance) in patients with chronic cardiac valvular, vascular, and renal disease is relatively less well understood. This evidence-based review seeks to examine the currently available data assessing the significance of troponin elevation in certain chronic valvular and other disease states. Delirium after cardiac surgery remains a common occurrence that results in significant short- and long-term morbidity and mortality. It continues to be underdiagnosed given its complex presentation and multifactorial etiology; however, its prevalence is increasing given the aging cardiac surgical population. This review highlights the perioperative risk factors, tools to assist in diagnosing delirium, and current pharmacological and nonpharmacological therapy options. The Arndt blocker is positioned in the desired bronchus using a wire loop which couples the blocker with a fiberoptic bronchoscope (FOB). The wire loop once removed cannot be reinserted in 5F and 7F blockers making repositioning of the blocker difficult. A 34-year-old female was to undergo left thoracotomy followed by laparoscopic cholecystectomy. The left lung was isolated with a 7F Arndt bronchial blocker. 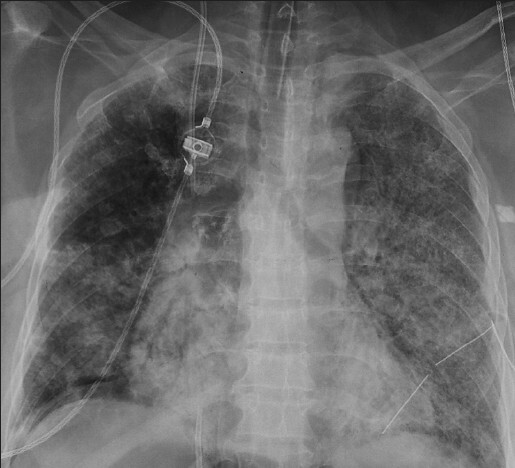 During one-lung ventilation, the wire loop was removed for oxygen insufflation. There was loss of lung isolation during the procedure and dislodgement of the blocker was confirmed by FOB. The initial attempts to reintroduce the blocker into the left main bronchus failed. An alternative technique using a glide wire was attempted which resulted in successful reintroduction of the Arndt blocker. The 0.032 inch zebra glide wire may be effectively used to reposition a dislodged Arndt blocker if the wire loop has been removed. Postoperative malignant hyperthermia (MH) is a very rare phenomena. It is generally observed within less than an hour after discontinuation of the anesthetic trigger. Present case describes rare delayed postoperative presentation of MH after off-pump coronary bypass surgery. Prompt recognition and immediate treatment with dantrolene can effectively treat the fatal syndrome. Family education and genetic counseling should be encouraged. We would like to describe a case with a complex aortic disease treated in hybrid fashion. We present an interesting case of a 65-year-old man with a medical history of hypertension, hyperlipidemia, and coronary artery disease percutaneously treated. An acute Type B aortic dissection occurred and treated with the implantation of a stent-graft which occluded the left subclavian artery due to its extension to the aortic arch. This event required a carotid-subclavian artery bypass due to ischemia of the left arm. An aneurysm in the innominate artery also detected, was treated with another stent-graft implantation 3 months later. 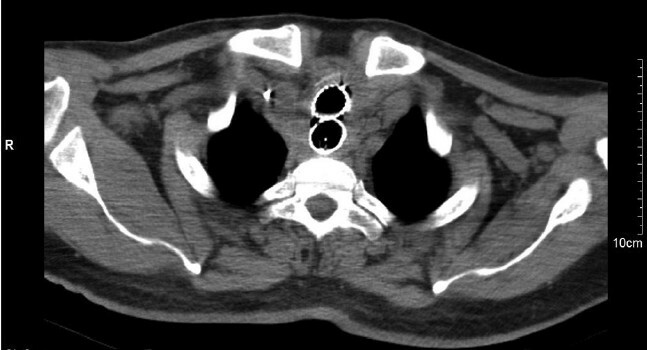 At 5-year follow-up, an aneurysm of the thyreocervical trunk was found while the stent-graft of the aorta was well-tolerated without endoleak and the carotid-subclavian graft was patent. The aneurysm was asymptomatic but considering the risk of spontaneous rupture of an aneurysm of this size, elective surgery was indicated. Because the aneurysm was very close to the brachiocephalic bifurcation, open surgical repair would require a sternotomy. The right common carotid artery and right subclavian artery were exposed. The thyrocervical trunk, right internal mammary artery and right vertebral artery were occluded by ligations to isolate the aneurysm. An 8-mm Dacron graft was anastomosed end-to-end to the distal part of subclavian artery. We would like through this case, discuss the role of the hybrid cardiovascular surgery to minimize the postoperative complications in complex cardiovascular pathology. We also discuss the international bibliography about the thyreocervical trunk aneurysm and the treatment options. Facing a patient with acute intermittent porphyria (AIP), there is narrow safety margin which circumscribe all the therapeutic actions including choice of drugs. This would become even more complicated when it comes to a stressful and drug-dependent process like a cardiopulmonary bypass. According to author's researches, no specific AIP case of tricuspid valve (TV) replacement is reported recently. Furthermore, fast-track anesthesia was safely used in this 37-year-old male known the case of AIP, who was a candidate for TV replacement and removing the port catheter. The patient was extubated subsequently, only 3 h after entering the Intensive Care Unit. The association of congenital pulmonary airway malformation (CPAM) with congenital heart disease is rare. We present the case of a 6-month-old child with atrial septal defect and pulmonary hypertension (PH) who presented with severe respiratory distress and hypoxia. The patient underwent right lobectomy for CPAM. With timely management, real-time monitoring, one lung ventilation, and adequate analgesia, we were able to extubate the child in the immediate postoperative period. We conclude that with meticulous planning and multidisciplinary team approach, such complex cases can be managed successfully. 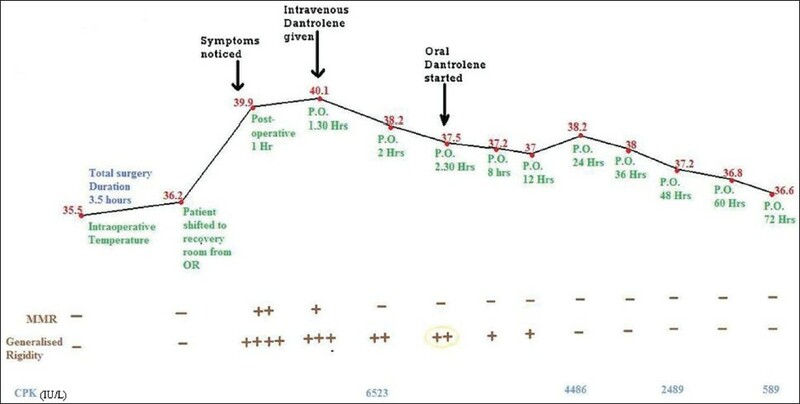 In this case report study a 41-year-old man envenomed by a bee sting and diagnosed as Kounis syndrome secondary to hymenoptera envenomation. 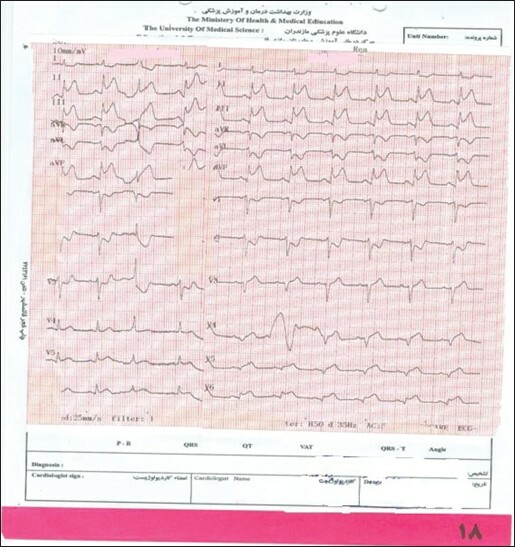 The patient developed a typical course of myocardial infarction, but the electrocardiogram changes were reversed to almost normal limits. He had a nonsignificant mild lesion in the proximal port of right coronary artery in coronary angiography. The case recovered and discharged after 6 days hospitalization. The clinical implications and pathophysiology of this dangerous association are discussed. Pulmonary alveolar proteinosis (PAP) is a rare lung disease characterized by accumulation of excessive lung surfactant in the alveoli leading to restrictive lung functions and impaired gas exchange. Whole lung lavage (WLL) is the treatment modality of choice, which is usually performed using double lumen endobronchial tube insertion under general anesthesia and alternating unilateral lung ventilation and washing with normal saline. It may be difficult to perform WLL in patients with severe hypoxemia wherein patients do not tolerate single lung ventilation. Extracorporeal membrane oxygenation support (ECMO) has been used in such patients. We report a patient with autoimmune PAP following renal transplant who presented with marked hypoxemia and was managed by WLL under ECMO support.